Deborah De Williams is the first woman to run around Australia (both continuously and non-continuously) During Deborah´s run she followed the guidelines/rule set by other Guinness World Record holders Gary Parson’s & Nobby Young. The rules state you have to run every day, no days off, with a min km requirement of 20kms/day and off course no driving anywhere! Others have said they have done it but only Deborah is the first female to have done every step, everyday with no driving. Latest news: After 408 days and 18,026kms Deborah and Maggie have finally finished their run around Australia. During the run Running Pink raised over $200,000 for the National Breast Cancer Foundation, Deborah broke the world record for the longest continuous run by a female and is officially the first female to run a completely GPS tracked continuously run around Australia. Deborah is also the the first person to have continuously walk and run around Australia. However Deborah beleives her biggest achievement is to have been an inspiration to 1000´s of people who have been effected by breast cancer. Deborah says "At the end of the day who cares about "first´s" and records my only hope is that I have help others get through and survive breast cancer. As Lance Armstrong would say "Live Strong" and as Maggie and I would say "Keep Smiling"
Congratulations to Deborah De Williams, Tasmanian Australian of the year ultra runner who today 6th May 2011 run through the existing World Continuous Run mark for a female about 6kms sth of New Norfolk. The mark was 17,925 and was held by Sarah Fulcher of the USA since 1988. Deborah has been about 30 days quicker and run 18,026kms by the time she finishes her run on Sunday May 8th at Hobart Mother´s Day Classic, she will have completed over 18,000kms. Deborah, a breast cancer survivor is the first female/person to walk and run continuously around Australia and has raised over $218,000 for the NBCF. Sarah Fulcher ran 11,134 miles (17926km) for 438 days around America. When finished Deborah will have run 18,026km in 407 days breaking Sarah’s record by 31 days and 100kms. On the 4th Oct 2010 Deborah and Maggie reached GPS co-ordinates S 12 52.139 E 131 08. 488 at the corner of Crater Lake Rd and the Stuart Hwy where Deborah ended her run last year. At this point Deborah become the 1st female and Maggie the 1st dog to run the ENTIRE distance around Australia*. Deborah is now heading to Melbourne where she will become the 1st person to run and walk continuously around Australia*. The rules for the continuious run are: you must travel the whole distance on foot under no circumstances can a car be used, you must run everyday, no days off, the minimum kilometres that need to be covered is 20kms a day and each leg must commence at the exact point where the last finshed off. Deborah and Maggie have decided to dedicate days that they run to people who have lost there battle with breast cancer. If you would like a day dedicated to your loved one please email Deborah to find out details of how this can be done. 1 solo female runner, her beautiful dog Maggie and an incredible inspirational journey around Australia all for breast cancer research. 2 laps around the country on foot and still going: The 1st female to walk around Australia, (continuous) Oct 2003 - 2004) the 1st female to run around Australia, (non-continuous) Ultra marathon, breast cancer survivor, World and Australian record holder, Tasmania Australian of the Year 2011 Deborah De Williams is still running! Deborah and Maggie (the 1st dog to run around Australia) are continuing to use their feet to support the National Breast Cancer Foundation. Due to the flooding in Rockhampton Deborah and Maggie have extended their run (again) and will not be home till 8th May 2011. By the time Deborah and Maggie get home they would have run 407 consecutive days and will become not only the 1st female to run around Australia (non - continuously) but the 1st female to run around Australia continuously*. What an amazing feat and all for the NBCF. To make a donation visit our donation page. Imagine being the first woman to walk around Australia to raise funds for Kids Help Line and breaking 5 world records in the process. You get home; looking forward to a well earned rest, and then you discover you’ve got breast cancer requiring intensive treatment. The treatment is successful, and you realize that you are one of the lucky ones because you survived. You know you’ve just been given a second chance at life – so what do you do next? Most people would sit back and take a breather, but not Deborah de Williams – Deborah decided to raise funds for breast cancer research by running around Australia! But there’s a twist……….. Deborah set out from Hobart, running via the east coast on the 26th October 2008 but her first attempt (1st half around Oz) was interrupted by Maggie (her dog) who decided that she had had enough running and tripped her over in Elliot, Northern Territory. Deborah broke her left foot -but kept running to Darwin, over 800 kilometers and ended up with a stress fracture in her right foot. Finally on the 6th June 2009 after running 224 days no stop and 10824 kilometers she decided to stop only after strict doctors orders, and returned to Melbourne for double surgery - plaster, crutches, cam walkers, rehab etc for 7 months. Even though the journey was disrupted Deborah managed to raise over $100,000 for breast cancer research. You would think that would be enough but guess what, she started out again on 27th March 2010, this time heading west, and on the 4th Oct 2010 she became the 1st female to run around Australia. (The "first" is NOT based on a continuous run but on being the first to achieve the distance). Of course her trusty dog, Maggie is still running with her and is now the 1st dog to run around the country. Deborah is one amazing Australian who’s passion to raise funds for breast cancer research comes from a genuine desire to help others. Her amazing fighting spirit is evident when after breaking her feet she was told at her first appointment with the surgeon to give up on her dream of running around Australia and that she would never run 1000 kilometres again! But this unstoppable girl has never given up and she has now achieved her dream of being the 1st female to run around Australia. But Deborah and Maggie have not stop, with the pressure off to be the "first" Deborah and Maggie will continue back down the east coast to Melbourne where that will achieve the world record for being The first person EVER to run and walk continuously around Australia before heading back to Tassie. What a huge endeavour and all for breast cancer research! By the time Deborah stops running she would have completed 2 and a half laps around Australia on foot!! When asked why? she would run again after breaking both her feet Deborah replied "I nearly decided not to run again, as I thought after surviving breast cancer, raising $100K during the first half around Australia and going through a serious injury maybe I had done enough but I received an email through my website from a lady who told me that if I could survive breast cancer and run again after breaking both my feet she could survive secondary breast cancer and I knew then I had to finish what I started." Deborah adds "Ultimately this journey isn’t about the records it’s about me trying to give hope to women going through breast cancer, maybe inspiring survivors’ that there is life after BC and honouring the women who have lost their lives to this dreadful disease." Running Pink - Running for a cure: The Deborah De Williams, World Record Run Around Australia is an epic journey on foot that started again from Hobart on 27th March 2010. During the enduring 400 days on the road, Deborah will be visiting over 300 communities, making over 250 public fundraising appearances, running on average 50 kilometres per day, everyday, with NO DAYS OFF to complete the world record run in May in 2011. A pink caravan convoy supplied by Regent Caravans will follow Deborah and Maggie around Australia. If you see our vehicles on the side of a highway somewhere out there or in your community do come and say hello. We just love to chat and Maggie as the Director of Greeting (D.O.G.) loves to greet people. If you can´t get out to see us you can email Maggie on maggie@runningpink.com.au or Deborah on deborah@runningpink.com.au. To find out when Deborah will be in visiting your community click here. If you would like Deborah and her pink convoy to visit your school, club or community group when she is in your town contact us here. 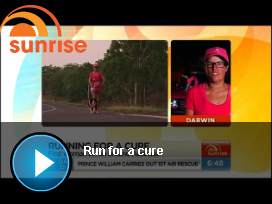 Running Pinks main aim is to raise over $300,000 for the National Breast Cancer Foundation. To achieve this goal, as we travel around Australia various Fundraising Stations will be set up in the communities we visit. So when we are in your part of the world come on down and buy some fantastic Running Pink merchandise, or make a donation, or meet Deborah and Maggie when they are in your community. To find out when these stations will be, see the up and coming events section below or email us on admin@runningpink.com.au. If you can´t make it on the day or we don´t visit your area, don´t despair, you can still purchase our grovvy pink products just click here and purchase through the website. If you are interested in selling the our wristbands or having a donation tin at your business please contact the team at Running Pink on info@runningpink.com.au. A fundraising effort like this one is only made possible with the support of many corporate partners and individuals whom all contribute in many ways. Running Pink is funded through the support of sponsors and by Deborah´s family, we are not asking for money to fund the run so all who donate can rest assured that all donations and proceeds from the sale of Running Pink Goods goes to the National Breast Cancer Foundation. Would you like a personally signed t-shirt from Deborah and Maggie then be part of our $1000 plus club. Visit the Supports Page on this website to find out more! !